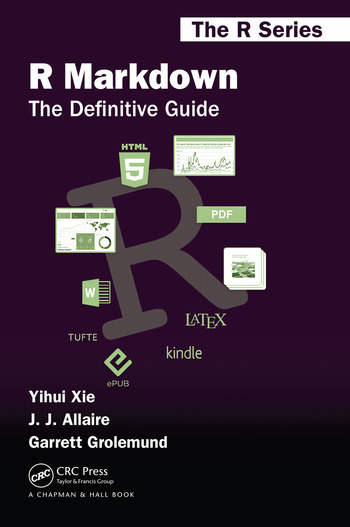 R Markdown: The Definitive Guide is the first official book authored by the core R Markdown developers that provides a comprehensive and accurate reference to the R Markdown ecosystem. 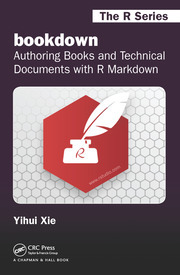 With R Markdown, you can easily create reproducible data analysis reports, presentations, dashboards, interactive applications, books, dissertations, websites, and journal articles, while enjoying the simplicity of Markdown and the great power of R and other languages. Advanced topics: Parameterized reports, HTML widgets, document templates, custom output formats, and Shiny documents. 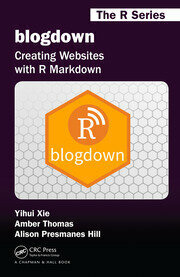 Yihui Xie is a software engineer at RStudio. He has authored and co-authored several R packages, including knitr, rmarkdown, bookdown, blogdown, shiny, xaringan, and animation. 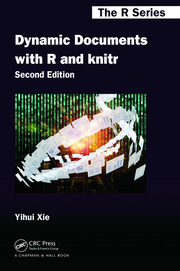 He has published three other books, Dynamic Documents with R and knitr, bookdown: Authoring Books and Technical Documents with R Markdown, and blogdown: Creating Websites with R Markdown. J.J. Allaire is the founder of RStudio and the creator of the RStudio IDE. He is an author of several packages in the R Markdown ecosystem including rmarkdown, flexdashboard, learnr, and radix. Garrett Grolemund is the co-author of R for Data Science and author of Hands-On Programming with R. He wrote the lubridate R package and works for RStudio as an advocate who trains engineers to do data science with R and the Tidyverse.